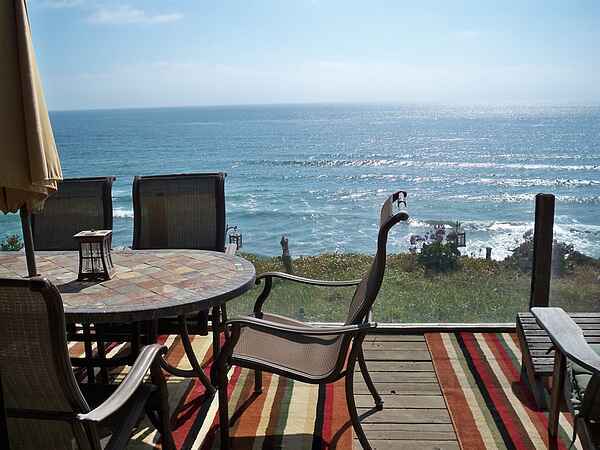 beach home in the most desirable area of Sunny San Diego. ocean views: the entire living area and the master bedroom. Location: between Del Mar and Carlsbad, north coastal San Diego. Legoland, Sea World, Del Mar racing, San Diego Zoo, San Diego Wild Animal Park, Carlsbad Company of Stores, Cedros Design District, Carlsbad Flower Fields, La Jolla close, Downtown Encinitas, Train and bus station close, public transportation within one block. You will not have to stress about leaving your office or work behind. You have all that you need to keep in touch at the office. Ocean Front views from the Living, Dining and Master Bedroom. Roomy with a great floor plan for privacy. All amenities, huge master suite with dressing area and vanity, walk-in closet large enough for a crib or your entire wardrobe, High Speed Internet and Wireless, plus a Copy/Scan printer, phone (with free 15 nationwide (USA) minutes of long distance per week included). Satellite TV in 3 rooms, includes the Premium Channels! Digital HDTV Flat Screen in Living Room! Tvs is two of the bedrooms, DVD in bedroom 3. Includes DVDs, Stereo and CD player, Library of dvds, Books, Magazines. One level home with a huge deck for dining and enjoying watching the surfers, dolphins, cruise ships and even the occasional whales go by!. Listen and relax with the fresh ocean breezes and sounds of the rolling surf! Really Great Floor-Plan! Full sized laundry room with large capacity washer & dryer, iron and board, hairdryers (2). There are 2 King bedrooms, and in the third bedroom, 2 extra long Twins that can be made into a King, plus one Single Roll-Away bed, one single pull out ottoman bed and a Queen Sofa Sleeper. Also available-Portable Crib, baby gates for deck safety, (deck is surrounded by glass too, and a fold out single mattress, plus all linens and utensils. Includes a 2 car garage that enters directly into the house for easy unloading and privacy, plus parking for 2 cars in drive, Beach Toys, Boogie Boards, Beach Chairs with a beach umbrella. Toddler cots, ask! If your toddler is not comfortable sleeping in a new environment, you can use a toddler cot for naps, or for sleeping in your bedroom with you as needed.